On January 1st of this year, Alitalia officially became a “new” Alitalia with partial ownership by Etihad. Does this mean Alitalia is no longer the worst airline in the world? Oh please. Sure, Etihad was quick to bring some of its own people to work on the Alitalia project, and big changes were promised. Now, the new strategy has officially been announced, and it looks a lot like what was proposed last year. It also looks similar to the one that Alitalia abandoned last decade after the merger with Air One. I highly recommend a read through the press release (on the Etihad site) announcing the new Alitalia. The first 600 words of the 1,000 word release contain absolutely no substance but hey, everyone needs to get a quote in, right? Those last three words are really the issue at hand. Etihad CEO James Hogan didn’t mince words in that regard. “…anything other than rapid, decisive change is simply not an option.” The airline needs to be profitable by 2017. Anyone want to make bets? So how will this miracle of profitability occur so quickly? Here’s how. This is where this whole plan starts to sound like déjà vu. The see-saw that is Milan will once again regain hub status. You might remember that Malpensa (which, hilariously, means “bad (or evil) thought” in Italian) was going to be a big, important hub around the turn of the century. Everything was going to be moved over there from close-in Linate. Riiiight. By 2008 when Alitalia was reorganized and merged with Air One, the opposite plan went into place. Alitalia decided to cut Malpensa while growing Linate. In the end, the only hub was Rome. Now, Etihad steps in and says, “hooray, let’s do both!” Now Malpensa will grow once again and become a long haul hub. It will see the reintroduction of 4-times-weekly nonstops to Shanghai, and there will be more frequencies to Tokyo. Oh, and did I mention daily nonstops to Abu Dhabi? Of course that’s the plan. But I’ll get to that more in a minute. Then there’s Rome. Etihad has big plans for Rome with new flights to a ton of cities: Berlin, Dusseldorf, San Francisco, Mexico City, Santiago, Beijing, and Seoul. More flights are going to be added to New York, Chicago, Rio, and yes, Abu Dhabi. Abu Dhabi will not only have widebodies from Rome, Milan, and Venice but there will also be smaller aircraft going from Bologna and Catania. It’s all about feeding the beast. And of course, the beast isn’t just in Abu Dhabi anymore. Notice the new flights from Rome to Berlin and Dusseldorf. That brings us to the next point. Sure Etihad will get some good traffic from Alitalia via Abu Dhabi, but long-bleeding Air Berlin will get a shot in the arm as well. Really, Etihad is trying to walk a tightrope here. It says it wants explore “further opportunities to deepen the relationships with Skyteam members and in particular Air France/KLM and Delta.” At the same time, it says Alitalia will have a “major” partnership with Air Berlin. There will be more coming with other airlines beholden to Etihad including Air Serbia and Etihad Regional getting in on the action. Sounds like a lot of growth for an airline that can’t make money at its current size. So how will this growth even happen? Ah, there it is. Alitalia is, as planned before, actually cutting its short haul fleet by sending 14 A320s over to Air Berlin. (Why Air Berlin needs more airplanes to help it lose money is beyond me.) But it’s specifically noted that Alitalia could take some of the widebody airplanes that Etihad has already ordered. Etihad basically shifts airplanes around between airlines as it sees fit. Now Alitalia joins that party. But will people fly this airline? Oh of course. What Alitalia needs is a new brand, including a new livery, right? No. But that’s what’s happening. The name will stay but everything else changes. Oy. Apparently the airline needs a new brand that will “capture and embody the essence of Italy.” Seems to me that the current Alitalia captures the essence of Italy quite well. So there you have it. The only thing of substance here involves network and fleet changes. The rest is all fluff at this point. Maybe we’ll see big changes and Alitalia will be profitable by 2017. Seems plausible, right? Yeah, right. 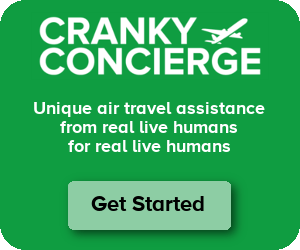 Cranky, have you ever thought about doing a post or a countdown series of posts on your top 5 or 10 worst major airlines and why? I think it would be a really interesting read. Pilotaaron1 – I really don’t like rankings in that sense, but it would be pretty easy to start to build it. Air India and Aerolineas Argentinas certainly deserve a spot. That would be a very interesting —and entertaining because well, it’s Brett writing. :-)— post on CrankyFlier. And Skyteam has a particular attraction to some bad flying experience, like Alitalia, Aerolíneas Argentinas and Delta. Etihad sounds like it just got a new toy to play with. But like all new toys, you get tired of it when a new one comes along. But since Italy hangs down below Europe, getting Europe traffic feed via Italy to/from AUH is what Etihad wants in a partner and they just figure AZ/Italy was a better option then OA/Greece. You know, I flew Alitalia this past summer in longhaul business class (thanks Skymiles!) and shorthaul coach and have to say, for all that people rag on them for poor service, I thought it was reasonably good overall. Some FAs were a little on the grouchy side but nothing worse than you would get on a typical day flying United. And some aspects, especially catering, were actually excellent. Most remarkable of all, I have never seen an airline so dedicated to preserving a premium experience. Every time I walked up to a business class check-in counter, the agent first asked for my elite card or confirmation I was flying premium class before he or she would do anything — which could be considered rude, I suppose, but given the likely chaos if they didn’t, I appreciated it. Similarly priority boarding was (usually) fairly well-enforced, and on a shorthaul flight in business class the FA made the most valiant (and ultimately fruitless) effort I have never seen to keep coach passengers from using the forward lavatory. Gawldangit…a day without a Cranky Alitalia post is like a day without sunshine. My week is off to a great start! With the legacy Luca di Montezemolo left at Fiat and Ferrari (particularly the F1 team), one can just imagine his impact at Alitalia. But then again, based upon the work culture he has/had to work with, maybe I’m a bit too harsh. The Alitalia A320s will replace Air Berlin B737NG aircraft leaving the fleet. Thanks Thomas. That makes me feel better about it. CF I believe the Air Berlin B737NG will then be going to Jet Airways. Well, the wheels will come off this Swissair Revisited strategy eventually, certainly when the next generation of the Emirate’s elite decide to focus on ploughing their dough into something other than their private airline. Etihad Regional already is on its last legs, based on recent press releases, cutting back feeder traffic and focusing again on “contract flying”. There’s only so much cash to go around out of the Emir’s kitty. You know, there are shades of Bethune’s Continental turn around in this. Getting the whole airline under the same brand, emphasizing the customer, rationalizing the network. Who knows, this time it might work.. In which case Eithad should try their hand with Continental II in the US.. They’ll probably need the help by at time. I see the livery is changing and I always wonder about that. Do they really think it makes a difference ? Does anyone actually choose an airline based on their paint jobs ? From inside the plane you can’t see it anyway. Why do they think this helps in anyway at all ? Ian – Well, the employees care a lot more than customers, I’d think. And maybe Etihad thinks this is one way of showing the employees the airline is different (and that the employees need to start acting like it). But that’s the only half-decent reason I can imagine. I still think it’s silly. To be fair, their livery is awful. The recent Etihad branding is spot on and just about rivals the American re-brand a couple of years ago. Time for an analysis of how Etihad’s strategy to take positions in all these European airlines is working out. It’s hard to believe it will end in anything other than a flaming crash. Seems like the Italian influence worked its way into Etihad with Etihad more focused on fashion shows and fashion shoots for its new cabin uniforms! And what really can Etihad bring to Alitalia except for the money? Look at Air Berlin….still money-losing. And poor service. Etihad Regional? What? Air Serbia….ah…no thank you. A bit of Aer Lingus? Or Air Seychelles? Unless Etihad does something completely amazing, they are building an airline coalition equivalent of Frankenstein. They should focus on customer service and inflight service rather than “flying nannies” (completely useless). Still a long long way to go to catch up to Cathay or Singapore. It all looks and feels a lot like the makeover that Etihad/AirNZ/Singapore gave the then Virgin Blue by turning it into the Swanky Virgin Australia it is now. 2/3 years on – Virgin is looking great and is about to hit profitability. Good luck Etihad! Any chance that Etihad will eventually have the same fate as its “idol” Swissair? So, how would Etihad’s strategy of buying stakes in airlines (most of which are actually older than it) affect it in the long-term? Will it become another Swissair or can they easily survive with or without its partners? CF, how strong of a possibility do you think it is for Etihad to consolidate all the European carriers down to one carrier at some point? Lots of operational sanity to be had there. (or perhaps even go the way of US carriers, have one “marketing” carrier that handles marketing, policies, GDS, call centers, etc, and leave the operating carriers legally but very strongly coordinate them? down into one. Nobody in Europe has been able to do that yet. Ugh. I’ve been trying to get Alitalia to cough up a flight booking fare class for a codeshare so another airline will post miles, and it’s been SEVEN MONTHS of emails, phone calls, and general bs from Alitalia’s New York office. I’m not even trying to get money or points out of them, just a piece of paper that shows the fare class for a ticket I paid for a year ago. Even the Skyteam people don’t like dealing with Alitalia. I say scrap the whole thing, fire everyone, sell the planes, and launch Italihad. As a travel agent… sorry … concierge, do you have dealings with Alitalia? How do they compare with other airlines? I see their planes flying over London everyday and they always look good. Actually that’s just an observation from a plane geek.